project has the following intention-targets: â&#x2014;? To equip youth workers with necessary skills and competences in order to address the democratic disconnect of young people using innovative techniques. â&#x2014;? To develop communication techniques interwoven with the social media society that inspires young people to be active citizens. General goals of the project â&#x2014;? To share effective Online tools the participating organizations are currently being using with the intention to engage people in democratic processes. 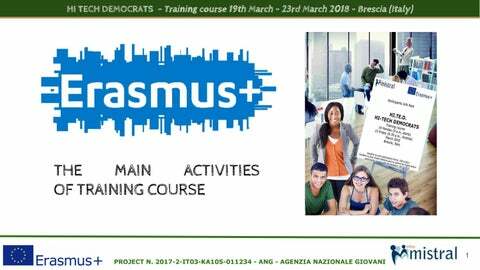 To strengthen the partners cooperation through the Erasmus + programme, in particular in the field of democratic participation of youth. Specific goals of the project â&#x2014;? To identify those digital mediums that motivates young people to actively participate Online. The participation ladder Participants reflected on the meaning of youth participation and discuss effective ways to increase their own participation in their local community. In this exercise we identified the rung of the ladder which we have been working on. Methods: acting by participants, debriefing, role play and discussions. Digital dialogue This simulation exercise enabled participants to use a mobile/tablet application (Idea Prism or cogni scope) in order to discuss a democratic topic. Methods: Simulation exercise, democratic dialogue. E-skills for democracy Facilitator provided examples of E-government initiatives and showed/explained them briefly. Participants shaped answers with concrete measures into groups and provided corrective proposals related to the existing initiatives. Methods: group discussion, sharing, class discussion and usage of digital tools. Democratic applications Participants were also asked to share their knowledge about â&#x20AC;&#x2DC;democratic applicationsâ&#x20AC;&#x2122;. Another mission for the participants was the assessment of the effectiveness of the applications, a procedure which included the suggestion of potential improvements or new applications. Methods: short presentation by trainers, discussions, share of information, feedback from the users of applications. Election alert We gave photos of elections from different parts of the world and asked participants to comment on them. Then we showed good practices of e-election methods of successful countries to prove that this actually works. Methods: Class discussion, encourage comments on visual and acoustic material, teamwork. The presentations were meant to 'ignite' the audience, by creating awareness or by generating possible actions on democratic issues. Participants voted the best presentations. Methods: Step by step coaching by trainers and cameraman, presentations by participants, variety of visuals for thematic input. Digital democratic media Participants had been invited to modify and post an influential message related to democracy in the form of a report, video or picture, in the digital media of their choice. Methods: group discussions, share and use digital tools. Visit the experts This activity was based on a visit to Piastra Pendolina Brescia which was considered an excellent example for the purposes of the project. Hence, participants had the opportunity to learn new techniques to control and disseminate their own messages to the wider audience. 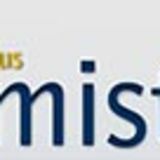 Methods: Inputs from experts, study visit. The free digital library Online material like e-articles, e-videos,e-forums,e-audios, blogs, movies, websites and e-books could enhance young peoples' knowledge on democracy. Specifically, participants came up with a list of online links and gave titles to them, in order to create a user-friendly â&#x20AC;&#x2DC;Digital Libraryâ&#x20AC;&#x2122;. Methods: Discussions both in working groups and in plenary, information gathering and exchange. E-bazaar Participants had the chance to network and deepen their relations by presenting their organization activities and good e-practices. Methods: slide show presentations , share presentations online, speech. Online petitions and campaigning Assess the truth about petitions and a bit of theory on that â&#x20AC;&#x201C; then we asked the participants to tell us what they consider as the real meaning of petitions and how we could use, in an innovative way this tool to promote democracy and enhance participation â&#x20AC;&#x201C; finally in groups or individually, participants designed their own petition or cause and they presented it in class. Methods: Class discussion, democratic dialogue, group discussion, interaction. Self publishing online Participants received all the necessary tools and guidance to create a letter, video (based on a story or a scenario) or anything shareable that creates awareness and turns young people attention to democratic issues. Methods: Inputs from experts , brainstorming, individual tasks. The e-challenge In this activity participants n brainstormed challenges related to democracy that can possibly go viral on social media ( like ice bucket challenge) Methods: Inputs from trainers, teamwork,brainstorming, blueprint.